"We were looking for something really special to set off our new building as well as improving the streetscape, and Artyface delivered. Our brief included East-meets-West artistic traditions and, by liaising with a local museum, this was achieved in a stunning way. 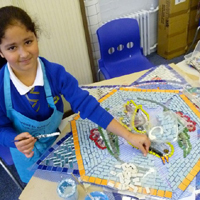 The children learnt much and really enjoyed making a mosaic they can be rightly proud of. 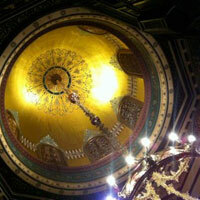 I love the mosaic, it's just awe-inspiring. Well done for finishing the job so well. Everyone loves it, especially the parents and children." 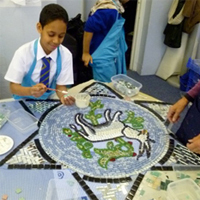 We are creating a colourful and exquisite mosaic sign for the entrance of Bevington Primary School which will be open to the whole community all day, but behind the new school entrance gates at night. 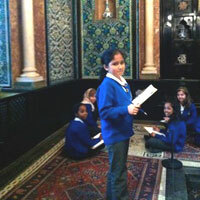 Year 5 and 6 went to the opulent Leighton House Museum to draw. Located on the edge of Holland Park in Kensington, the house is one of the most remarkable buildings of the 19th century. It was the former home and studio of the leading Victorian artist, Frederic, Lord Leighton (1830-1896). 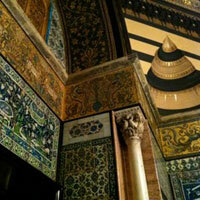 The Arab Hall is the centerpiece of the house where Lord Leighton used to entertain, complete with a fountain. 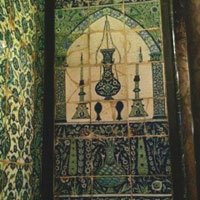 It was designed to display Leighton's priceless collection of over a thousand Islamic tiles, mostly brought back from Damascus in Syria as well as peacock blue tiles by the ceramic artist William De Morgan. On the first floor is Leighton's grand painting studio. 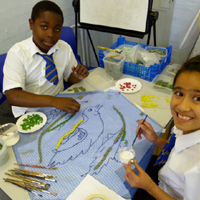 The drawings have been collaged into a design for a mosaic that we then made with the pupils in the school in December. 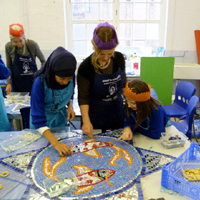 Many of the staff, some parents and Governors also helped the children to make their Leighton House inspired mosaic. 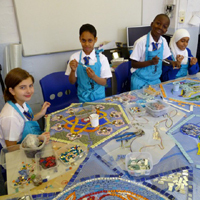 Headteacher John Towers said "it's such a fantastic piece of work, it looks beautiful". 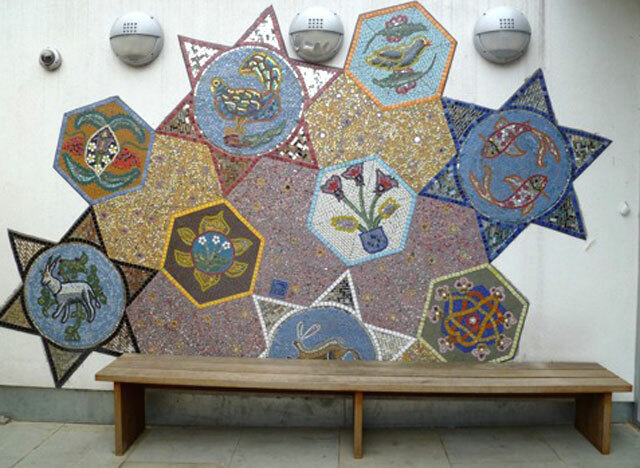 We are looking forward to putting it up when the weather warms up in the Spring and seeing the different colours and textures brightening up the school entrance and sparkling in the sunshine. 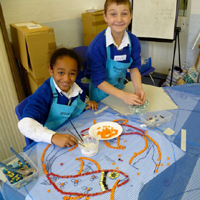 "We took a bus to from our school, then we walked past Holland Park School, then we arrived at Leighton's house. The artist called Catherine told us about when Lord Leighton built his house and what he did with it and when he died. When we went into the house we first went to a room that had Arabic writing on the walls. Then we went in groups and looked around the house and started drawing." 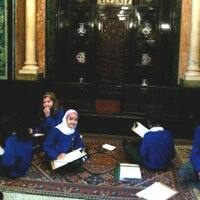 "When we were at Leighton House we had to focus on the drawing we were doing and draw carefully. The house was fantastic and it was interesting with wonderful drawings. It had a secret door and room and I heard a hoover in there. 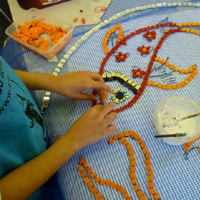 Our drawings have turned big now and we are tracing them with a marker pen. 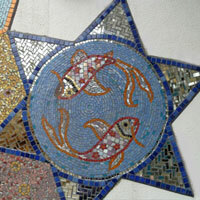 After, we are going to start putting tiles on them to make a mosaic. At Leighton House there was a fountain that squirted out water and it went high when they turned it on - very very high, up to the light". 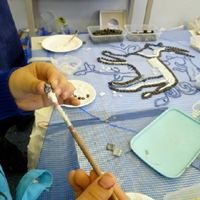 "We went to Leighton house and we drew patterns we liked. Then they were copied on to paper for the design and they put blue netting (fibre-glass mesh) on top. 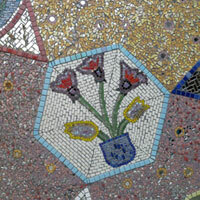 We like the mosaic because it looks really cool and amazing. We like putting the tiles in one by one. Tiles come in all different colour varieties. Once we put the tiles on they would look amazing. 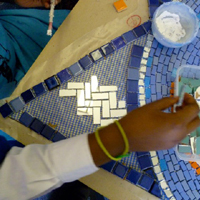 Some children have been getting to cut the tiles, but they also took part sticking tiles on." 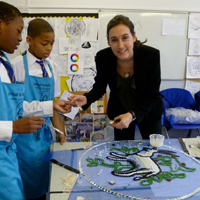 "I like doing mosaics based on the drawings we did at Leighton house. 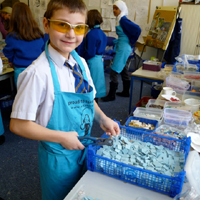 We used a lot of different tiles such as glass, ceramic and even hand-made tiles. 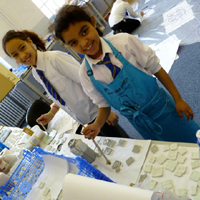 A lot of children got to do gluing. Some got to lay them out for other children to stick. 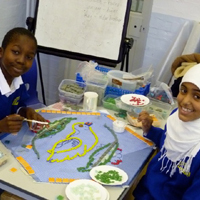 Our pictures are of fish, peacocks, leaves, a goat, birds, flowers and some people are even working on an Arabic flower. I think the most beautiful mosaic is the peacock because it has a shiny mirror frame, shiny gold eyeliner and inside the body colours are gold, yellow, blue, turquoise, brown, black, purple, pink, green and an orange outline. 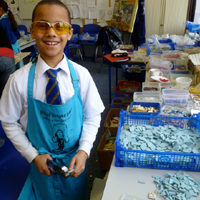 Everyone from 5/6 is going to have a go." 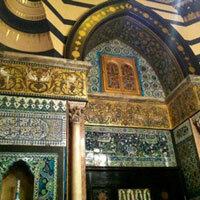 "First, when we went into his fabulous house, we went in his room which had Arabic writing all over the tiled walls. 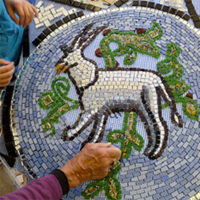 Today, when I went to help with the mosaic it was a fabulous experience. I worked on a bird with Yassin and someone else. 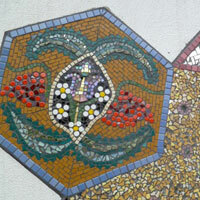 I also I really wanted to say that I enjoyed the art work as well as the experience of seeing other people's mosaics. Also I enjoyed working in a team with other class mates."